Moviegoers who own dogs are reliable suckers for dog movies, especially when those movies are as inherently inspiring as “Pick of the Litter,” a documentary about the process of training guide dogs for the blind. But dog people also tend to be sensitive to when said movies are fudging matters in the interests of narrative streamlining or keeping things cute, and “Pick” often feels like a project that has been overly groomed. Will you still be moved to tears? Most likely. Co-directors Dana Nachman and Don Hardy Jr., follow five Labrador littermates from their birth at Guide Dogs for the Blind, a San Rafael, Calif.-based nonprofit that has placed over 14,000 service dogs with vision-impaired people since the organization’s founding in 1942. 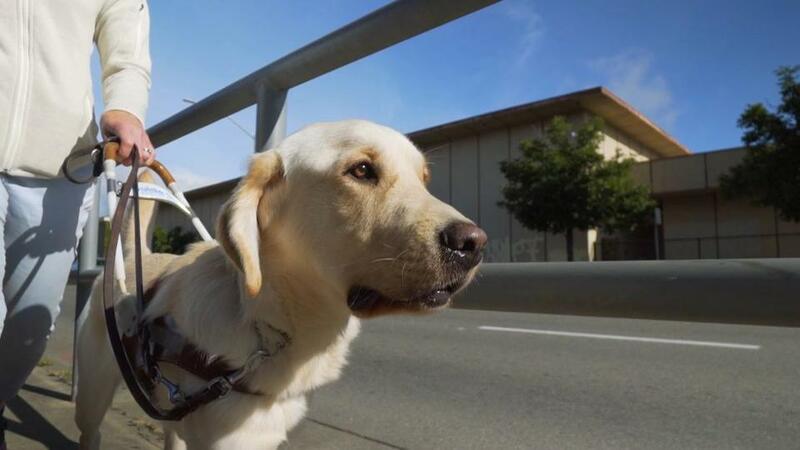 To keep viewers engaged, the filmmakers structure the documentary as a reality-show competition: Which of the adorable quintet will make it all the way through the various levels of training to become a working guide dog for the blind? Which ones will not meet GDB’s appropriately rigorous standards and be “career-changed,” a euphemism that has the ominous ring of a Soviet gulag? The pups are charismatic and quickly individuated, and you’re free to root for all five — Potomac, Patriot, Primrose, Poppet, and Phil — even without the animated scorecard that occasionally pops up to tell you who remains in the running. Not surprisingly, though, “Pick of the Litter” ends up being more about the humans than the canines. After being whelped, the dogs are placed with “puppy raisers,” volunteer foster owners who start them on in-home training. Some of the raisers here are old hands, others are newbies, and all are advised against growing too close to dogs they’ll have to give up in a year or so — an impossible task and one in which more tender souls are clearly bruised by GDB’s efficient but mysterious relocation policies. Some further inquiry on the part of the filmmakers would have gone a long way here. “Pick of the Litter” strives to keep the tone upbeat and its five narrative threads romping forward, sometimes at the expense of exploring the side-trails. One of the most moving vignettes concerns Patriot, a dog who may prove to be too bouncy for guide work but who also appears to be an emotional anchor for his raiser, an Iraq War veteran struggling with PTSD. At its best, “Pick of the Litter” prompts simple awe at the capabilities of these smart, focused, loving four-footed companions, whom we’re encouraged to think of as “working dogs” but who are so much more to the men and women to whom they’re ultimately assigned and for whom they open the world. Watching Phil tackle his five final tests, which include correctly disobeying the direct commands of his handlers when dangerous obstacles such as cars present themselves, is an occasion for both suspense and boundless gratitude that these animals have made it their business to live with us and lead us forward. That’s why the reality competition stylings feel tacked on: In “Pick of the Litter,” everybody wins. Ty Burr can be reached at ty.burr@globe.com. Follow him on Twitter @tyburr.